The surfboard features inspirational artwork created by students from Carusi. 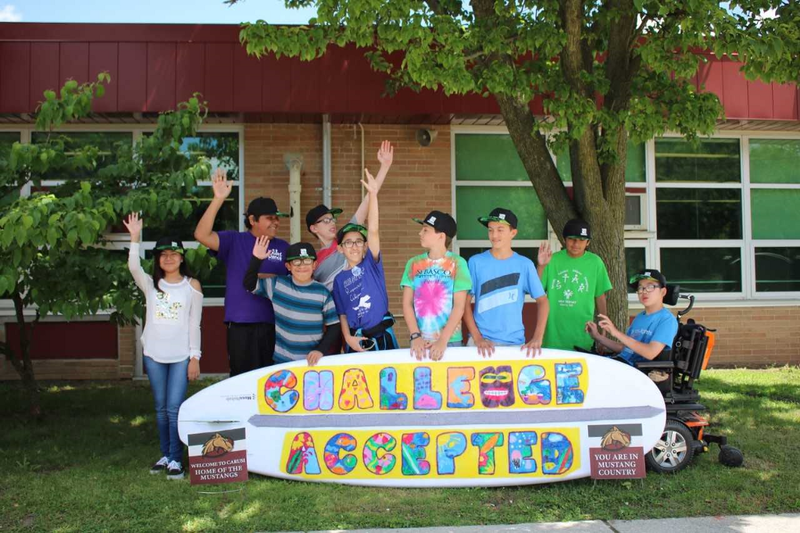 On Friday, June 15, representatives from MossRehab were present at the Carusi Middle School in Cherry Hill to receive a custom, one-of-a-kind surfboard designed by science teacher and surfboard shaper Luke Alvarez that features inspirational artwork created by students. The surfboard will be used Aug. 5 at They Will Surf Again, a free, one-day event in Wildwood that gets persons with disabilities into the ocean and riding waves with the help of volunteers. MossRehab sponsors They Will Surf Again, the flagship event of the Life Rolls On organization, and has sent close to 300 volunteers to the annual event over the last seven years. When shaping the board, Alvarez, whose company is named Generic Brand Surfboards, works with input from MossRehab and surfers who have participated in They Will Surf Again in the past. The result is a board huge in proportions that make the board extremely stable and capable of carrying the weight of two riders (a surfer and volunteer) when necessary. The deck of the board also features a thick pad for comfort and grip and attachment points for adjustable hand straps. The artwork, designed by the Carusi Middle School students, took MossRehab’s inspirational “challenge accepted” motto and filled each letter with colorful beach and surf- inspired designs like hibiscus blossoms, tikis, dolphins, waves and palm trees. They Will Surf Again will be held Aug. 5 from 8 a.m. to 3 p.m. at the beach at Baker Avenue (behind the Convention Center) in Wildwood. Registration to volunteer or participate begins June 20. Register online at LifeRollsOn.org/NewJersey.